Queen Amelia's heart problems became worse in 1902 when she was 38 years old. Her doctors advised a long period of rest,and suggested a voyage. The Queen listened to their advice and took her two sons with her for a three-month trip in the Mediterranean on the yacht Amélia. It was a great opportunity for her and her children to visit other places and cultures. Luis Filipe and Manuel were astonished by the great centres of civilization of antiquity. They also received visitors like Prince Albert of Monaco with his children, Prince Ferdinand of Bulgaria, Crown Prince Wilhelm of Germany with his brother Prince Eithel, the Duke of Connaught, and some others. This trip was used by republican newspapers as an excuse to describe lavish parties that were given to foreign royal guests, and they even mentioned the amount of coal on board to keep the royals and their guests warm at night. Another thing that angered the republicans was that King Carlos offered yet another luxurious yacht, called Sunshine, to Queen Amelia as a birthday present. Due to the criticism Queen Amelia had to give up her old yacht, Amélia, and donated it to the corporation of pilots. The year 1902 was a dramatic year for Queen Amelia, with several deaths in store. The first shock was the suicide in January of Prince Luis Filipe’s tutor, Joaquim Mouzinho de Albuquerque. He could not handle the rumours circulating in the palace about his platonic passion for the Queen. In June, Queen Amelia had some serious heart problems. On a more pleasant note, she had the joy of seeing her elder son taking his first steps in the international scene. Luis Filipe, only 15 years old, was the King's official representative at the coronation ceremony of King Edward VII in London. However, when Luis Filipe returned from England, Amelia had a stroke. To worsen the situation, some of her close friends died or suffered other accidents and there were rumours that she and Carlos were becoming estranged, which was true. Before Carlos became King, he used to ask for Amelia's opinion about political events, and she liked to be close to these issues. But after the death of King Luis, King Carlos had his own counsellors and did not ask his wife for advice any longer. The couple was definitely more popular abroad than in their own country, apart from Madeira and the Azores where they made the most memorable of their visits in the summer of 1901. The royal visit had been planned for months and the enthusiasm of the public was huge. The main focus of that attention was Amelia; her kindness, her capacity to listen, and her ability to give accurate opinions to everyone who decided to talk to her, helped make the royal visit a success and endeared the royal couple to the people of both Portuguese islands. Amelia was more than just a Queen to many Portuguese. While her mother-in-law Queen Maria Pia was formal and more conscious of her duty as a consort, Amelia was like a mother to the people, and her admirers were enchanted by her tender and calm demeanour. Besides that, Queen Maria Pia never made a great effort to learn the Portuguese language correctly while Amelia thought it was an important thing to do. In November 1904 the royal couple visited England to improve relations between the two countries. King Carlos demanded a major security force for himself and the Queen. Some found his recent concern or even obsession for security curious, but it was quite understandable since the political atmosphere in Portugal was hostile. Some newspapers even wrote: “For much less, Marie-Antoinette was killed.” The trip to England would be refreshing for Carlos as he and Edward VII shared a true friendship. But England was not the only country they would visit. Spain was an important country to Portugal too, due to the strong commercial bonds between the two countries; and the family ties between Amelia and the Spanish royal family helped in making this a successful visit. The Queen really liked Andalusia, where she attended some bullfights. King Carlos' efforts to forge good diplomatic relationships with the colonial European powers (England, Germany, France, and Belgium) was aimed at protecting the Portuguese territories in Africa. His efforts resulted in a succession of official trips to Portugal by foreign heads of state. One of those visits was from President Émile Loubet of France, who visited Portugal in 1905. The initial meeting between the President and the Queen must have been difficult for both of them. He was the representative of the regime that had exiled Amelia and her family; however, the friendliness and even the chemistry between them was immediate. When the royal band played the Marseillaise in front of the Rossio train station, in honour of the President, voices were heard giving hurrahs to the republic. President Loubet raised his hat in thanks, but everybody understood that the crowd's cheers were a protest against the monarchy. This event shows that King Carlos' efforts to maintain good diplomatic relations with other countries was not good enough for his own people. It did not compensate for the growing anger about domestic problems. Social discontent was rising, new ideologies like socialism were emerging, the influence of the Catholic Church in society was declining, and industrialization opened doors to organized labour unions. The republican opposition organised revolts and both the Carbonaria (the armed wing of the Republican Party) and the freemasons conspired against the King. The monarchist parties fought among themselves and made the regime even weaker. During the 21 years of Carlos' reign, Portugal had ten governments, most of them led by left-wing politicians. This all made Portugal a powder keg, just waiting to explode. The opposition was in a rage because of João Franco. Against the will of most political parties, King Carlos, facing the crisis that was affecting Portugal, appointed Franco as Prime Minister in 1907. Franco quickly established an authoritarian government. The displeasure with Franco and the rising criticism that Amelia was interfering too much in national politics (she wrote every day to Franco criticizing his policies) strengthened the republican movement. In Lisbon there were rumours that the King's life was in danger. The Count of Mafra wrote in his memoirs “they want to kill my King…” Carlos, who was in Vila Viçosa, was aware of the explosive situation but still wanted to return to Lisbon on 1 February 1908. Prince Manuel waited for his parents and brother at the Terreiro do Paço, a large square in downtown Lisbon, close to the river Tagus. When the family arrived they had a delay of four hours, which annoyed the King greatly. He refused to ride in the closed cars provided for their security, and insisted on travelling in an open carriage. At that moment there were very few people in Terreiro do Paço. When the carriage containing the royal family got close to the western corner of the square, two republicans shot at the royal carriage. The King was shot in the neck and died immediately, while Crown Prince Luís Filipe was mortally wounded after trying to shoot the murderers of his father. In the chaos that followed, the two murderers were killed by the police. While Prince Manuel cleaned the blood off his brother's face, someone shot him in the arm. Amelia was close to the gunman, and she stood up and hit him with her bouquet, which had been presented to her only minutes before. This situation caused even more confusion but it saved Prince Manuel, from being shot by other assassins. The chaos was complete, and many accomplices were able to escape. The Queen recognized a very prominent political figure as one of the participants in the murders. When Buiça and Costa (the two official murderers) fired on the royal carriage, Queen Amelia looked straight into the face of a man who stood a little beyond the carriage and who was in the act of drawing a gun. The struggling of the police, soldiers and citizens quickly hid him from view. “Who was he?” was the question that everybody asked. The police asked Amelia to reveal his identity, but, fearful for the safety of her remaining family if she identified him, she said she couldn’t remember who he was.The Queen looked at hundreds of faces; she visited the Chamber of Deputies over and over again, hoping to see a familiar pose or gesture in some of them. It was all in vain. The rumours started soon, as everybody wondered who that man could be. It was suggested that he could be an important political figure, like Queen Amelia had said to the police, but there were also insinuations that reasons of a romantic nature sealed her lips... Queen Amelia carried the secret with her forever. 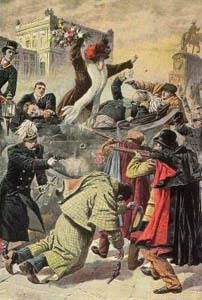 Some years later, when the monarchy had been abolished, Jose de Alpoim (a republican leader) confessed that the regicide had been planned by the anarchists together with Afonso Costa, the leader of the Portuguese Republican Party and one of the major figures of the Portuguese First Republic. After the regicide, something changed in Portugal. As the atmosphere became more explosive, Queen Amelia and her son were driven in closed cars to the funeral. Thousands of condolences arrived from all Europe. Most monarchs in Europe were not only related to King Carlos but they were also his friends. Edward VII, the British King, was one of them. He attended a Requiem for Carlos and Luis Filipe at the catholic St. James Church in London. It was the first time since the Reformation that a British monarch had attended a Catholic ceremony. Queen Amelia knew that from now on her duty was to guide and assist her young and inexperienced son in his new position, a position for which he was not adequately prepared. On 6 May 1908, Manuel was proclaimed King of Portugal. He would be the last king of the country, and his precarious reign would last for only two years. Amelia, now known as Queen Mother, had a great deal of influence on her son. She used to call him “mon petit roi” because he was so young. Her influence on him was so strong that they even posed together for the international press in his office. The Queen Mother usually wrote the official texts that her son would sign; she read the dispatches and gave her opinion about political issues. She even presided over political meetings. Her interference fueled even stronger attacks on the monarchy. Soon after Manuel was proclaimed king, he paid an official visit to Britain. This visit was important to his mother and other courtiers, and was seen as a way to find him a royal bride. When he returned to Portugal he mentioned Princess Alexandra of Fife, granddaughter of Edward VII, and Princess Louise of Battenberg (who would later become the second wife of King Gustaf VI of Sweden). But none of the potential brides' families were interested in marrying their daughters to the son of a murdered king. The official excuse was the different religion of the young people involved. After a very successful trip to the north of Portugal, the new king visited the most important European courts. He wanted to become acquainted with other monarchs. King Manuel was, however, not as gifted as his brother in political affairs, and he committed several faux pas during his trip, including an indiscreet liaison with an actress in Paris, which led to accusations that he was amusing himself with affairs of the heart and ignoring the situation in his own country. In Portugal he was full of new ideas to mend the divisions that existed throughout society. He dismissed the dictator João Franco and his entire staff, and free elections were held. The republicans gained seven more seats in Parliament, and some were elected mayors of important cities, among them Lisbon. But the democratic result was not enough for the republican opposition, and a revolution was prepared. On 4 October 1910 Manuel received his first official visit from the President of Brazil, Hermes da Fonseca. There were rumours that a republican revolution was imminent, and some ministers simply vanished into thin air. During the dinner, Manuel was informed that a revolution had started, and he decided to shorten the dinner and quickly left for the Palace of Necessidades. During the night, shots could be heard at different locations in Lisbon. In the morning republican red and green flags were flying over official governmental offices. The Army joined the revolution and expelled the King by shooting at the palace with the marine cannons. The republic was officially proclaimed on 5 October 1910; the Portuguese people, however, were never called to vote in a referendum to accept or reject the republican system. When the revolution started, Queen Amelia and Queen Maria Pia were in Sintra. When they were told about it, Amelia immediately left to be with her son. Her intentions were not to comfort him or to start weeping; instead, she came to make sure that the King remained strong so he could do something to save the situation. She was furious at the apathy of the monarchists and decided to face the danger with all her energy. But when the warships shot at the Palace of Necessidades, where the King was staying, there was very little that could be done. The palace was hit, and the royal family was forced to leave Lisbon and went to Ericeira. Here they realised that the situation was hopeless. King Manuel, Queen Mother Amelia, Prince Afonso (King Carlos’ brother), Queen Maria Pia, some friends and ladies in waiting of the Queens, and the King’s secretary, the Marquis of Soveral, left Ericeira on board the yacht Amélia, heading for Gibraltar.